Food, the thing that keeps you going on the trail. For the past couple of years I’ve been opting for freeze bag cooking. I think it’s really neat, packs small, no dishes to do and you got mini-trash-containers for each meal. Is it always the most fun things to eat? No. But for me personally, the food I bring on a trip I see more as fuel rather than a dinner at a fancy restaurant. For this 8 day trip I’m bringing 7 breakfast soups, 16 bags of noodles, 18 powerbars and 4 bags of nuts and candy for that extra punch. Total weight is 3900g so roughly 490g per day. Between 400-500g per day is good enough for me with the things I’ve chosen. 8 days worth of supplies is quite a lot for my Zpacks Arc Blast backpack, almost bursting at that point, but it’s doable. Best thing with food is that you consume it and after even two days it’s way easier to close the bag. Before I leave my tent in the morning I always bump the meals that I’m gonna be using through out the day. Putting Noodles in the back mesh pocket and snacks goes in the side pockets for easy access while walking. If it’s a really small meal I can even put it inside my cooking kit that I have right now. All of the above will save you time and not having to dig through your food bag inside your backpack. If possible I try to have everything I need during the day in the mesh pocket so I don’t have to open the main compartment of the backpack. Before going to Vålådalen, Sweden, 2016. 7.5 days worth of supplies. 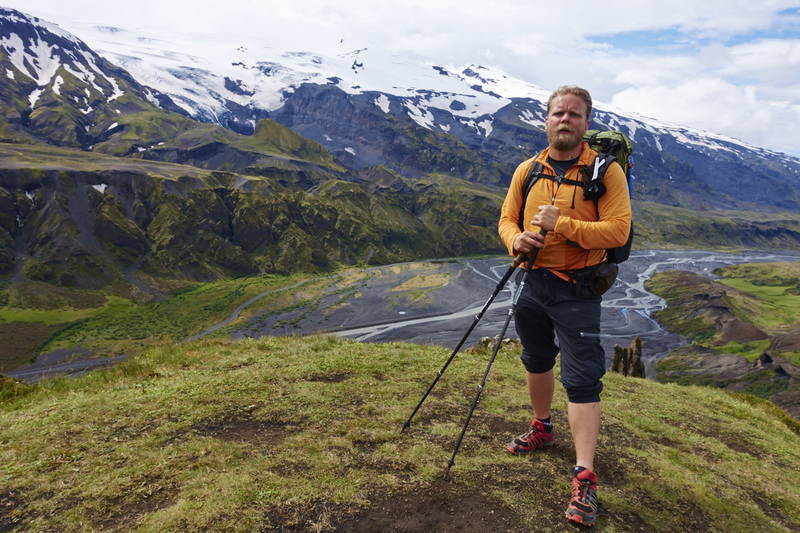 Here’s a rundown of what I brought to Iceland. All in all I’m very please with my gearlist and how everything works together. But sure, some items could be switched to lighter alternatives especially some clothing. I mainly refer to my Patagonia items. I’m a big Patagonia fan and that’s also why I don’t see any need to switch them to anything else before they break down completely. And this far they’ve held up really good! One of my latest additions to my list. Sold another backpack for this one and I haven’t looked back since. Very good quality and super comfortable. Also quite new, have had a few nights in it but not any cold ones. I had great hope that it would perform as I liked and I can’t say anything else. Cold/warm nights aren’t a problem as you just cinch it tighter or leave it open depending on the weather. Had the coldest night in it since I bought it, around 0 degrees centigrade and it wasn’t a problem. If it would get a bit colder than that you’ll have to sleep with more clothing on. For around zero you’ll be good in long johns and a shirt. If it was a liiittle wider it would be perfect. Happy with the length if I just put a sitting pad under my feet during the night to keep them off the cold ground. I’ve had this for some time now and it always feels like a safe place to sleep. One thing that I’ll probably change in the future it’s the HMG pole straps. They’re not bad but not the best either. If something will fail with the shelter it’s probably them. I’ve looked at a few options and I think I’ll have some sort of pole extension. Probably the “The Missing Link“. Good stuff but a little heavier than other options on the market right now. When I got it there weren’t any real good options to this one. Happy with it. I’ll just be a little lazy here and not put everything out here from my list. 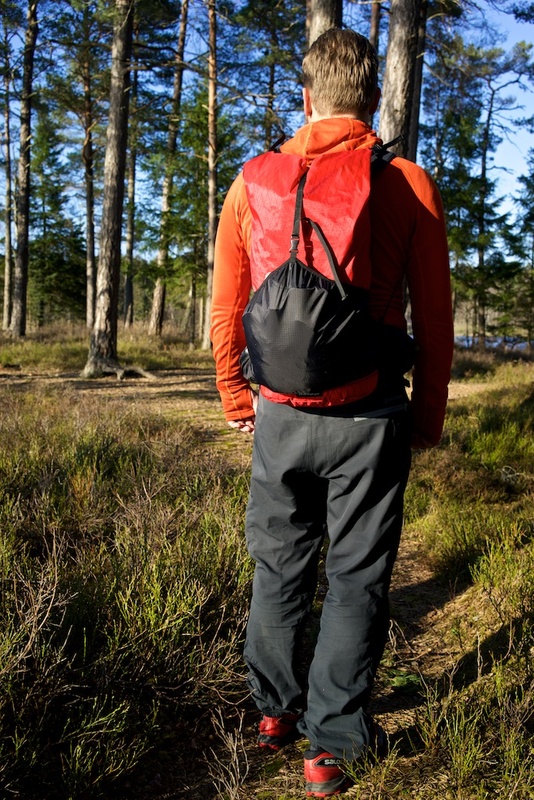 As I started this post I mostly use clothes from Patagonia and they’ve always performed well. Nothing to complain about really other than they could be a little lighter. Great buy, cheap and durable! After this trip I’ve bought new inner soles just as an easy upgrade. Not really sure that my current ones are worn out but better safe than sorry. Have walked +300km in these and on the outside the mesh still looks good and the sole still have plenty of grip left. 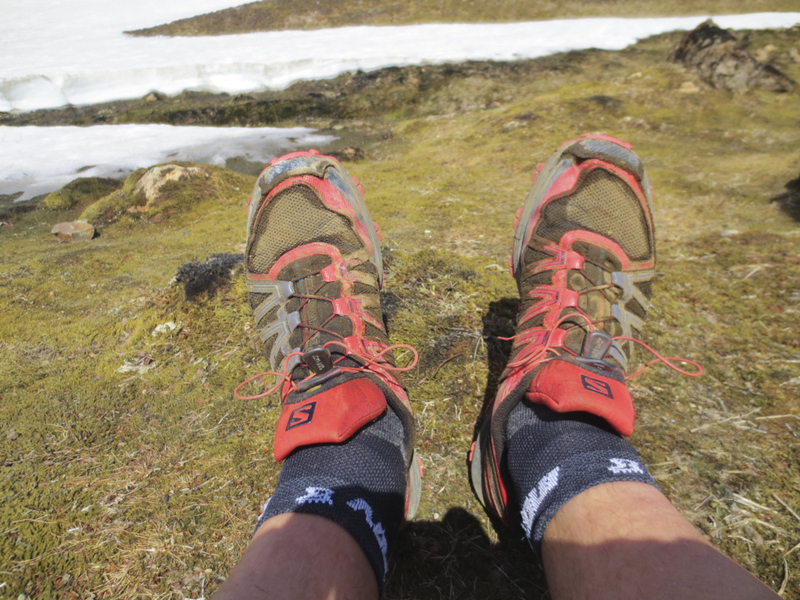 Something to note is that the grip will eat away faster on rocky terrain like in Jotunheimen rather than the mixed terrain on Iceland (go figure). Well… They’re comfortable but won’t keep your feet dry long enough even if you just use them round camp. When they’re brand new the do the trick pretty good but the GTX membrane will deteriorate quite fast. Will probably look for a replacement. Great watch with good battery life. Unfortunately it has been acting up some times and have had problems with acquiring a good GPS-fix. I’ve noticed that it’ll “jump” a few hundred meters in all directions and then coming back to a good fix (out on the trail). It’s completely on random as far as I know and I haven’t found anything on the internet saying that this is a common problem with the particular model. I’ll just have to get in touch with Suunto’s customer service and see what they think. Great little camera! I was very please with the quality of the pictures. It’s most definitely comparable with the expensive DSLRs on the market like the Canon 5D Mark II. Just, wow, everytime you use them. When you’re out there you don’t really think about them, they just work. 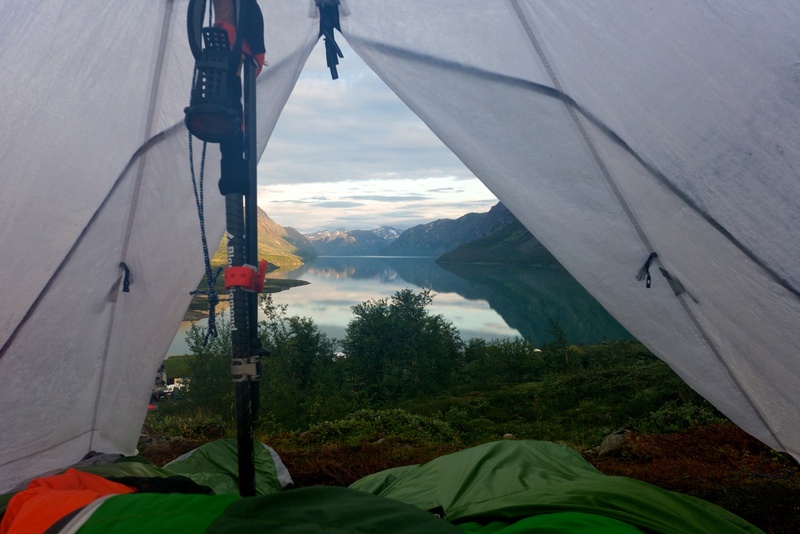 They never complain, the flick-lock system hold everything in place during the day and the night when it supports the tent. Can’t recommend them enough. These I just got before we left for Iceland. Replaced my sleeping bag stuff sack with one of these and the other I used for the food. Worked just fine, nothing to complain about. Aaah, the kitchen. What makes you go further (and lighter). Works great with both alcohol and wood. For this trip it was only used with alcohol and we had no problem with it even in windy conditions. The stove and HMG stuff sack filled with food. To sum things up I’m very happy with everything I have right now and there isn’t anything that i really need to change because it’s not working right now. 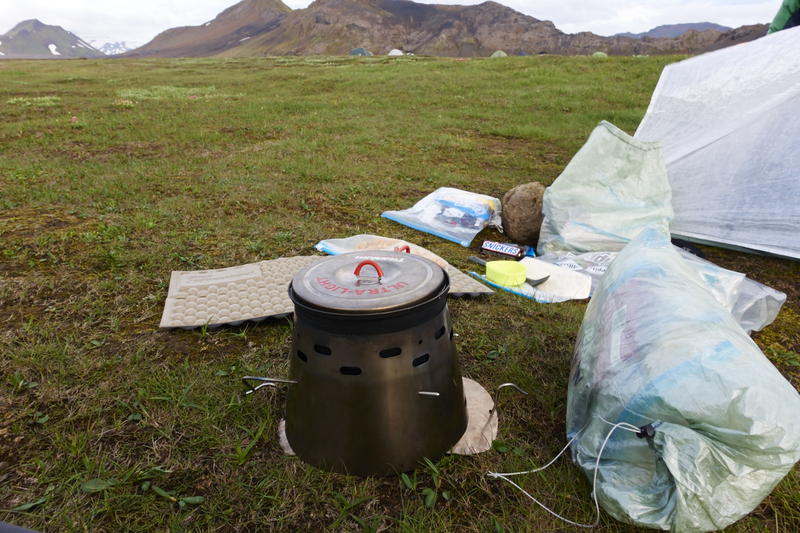 But there’s always possible to upgrade some items just to be safe like with the adaptor for the hiking poles to support the shelter better in high winds. Final day of the trip on top of volcano Magni. Carrying all I needed for the trip. No less, no more. So now with some time to reflect after the trip it’s time to do a gear rundown. In general I am very pleased with the kit I carried for this hike. I used more or less all the items carried, never felt that anything was missing and managed to be fully self sustainable during the whole trip. Here is a quick walk through of the gear I brought on the trip. I have kept the information very short. If you have any more questions, don’t hesitate to ask! The suspension of this pack is totally fantastic. After five days and 100 km + of walking I felt like I hadn’t even worn a backpack. No problems with aching shoulders, no sore hips after the belt and the vented back actually helps a bit to get the sweat of my back. The only downside is that the mesh on the front pocket got ripped in a couple of places. I don’t have any good ideas how to fix this so i guess I’ll have to live with it. A bit disappointing for 400 dollar backpack to. 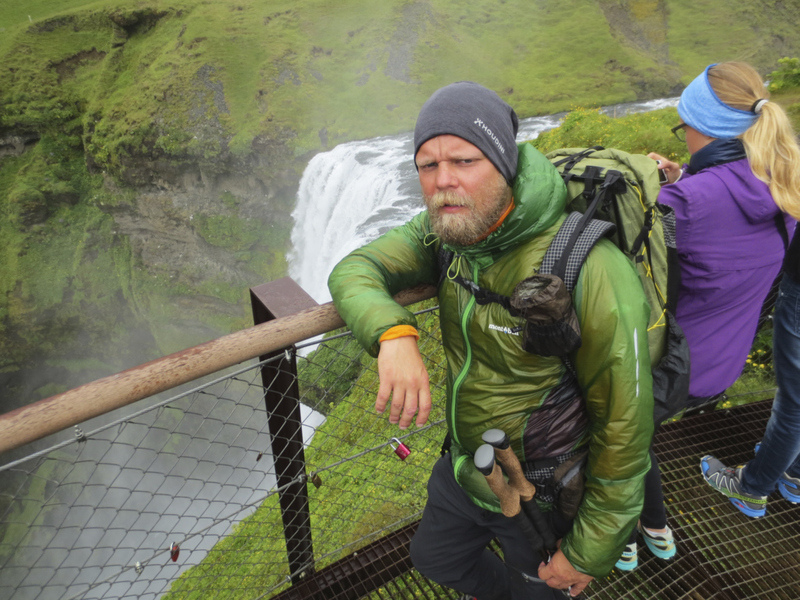 Striking a pose above Skogafoss. My shoulder pouch well visible. 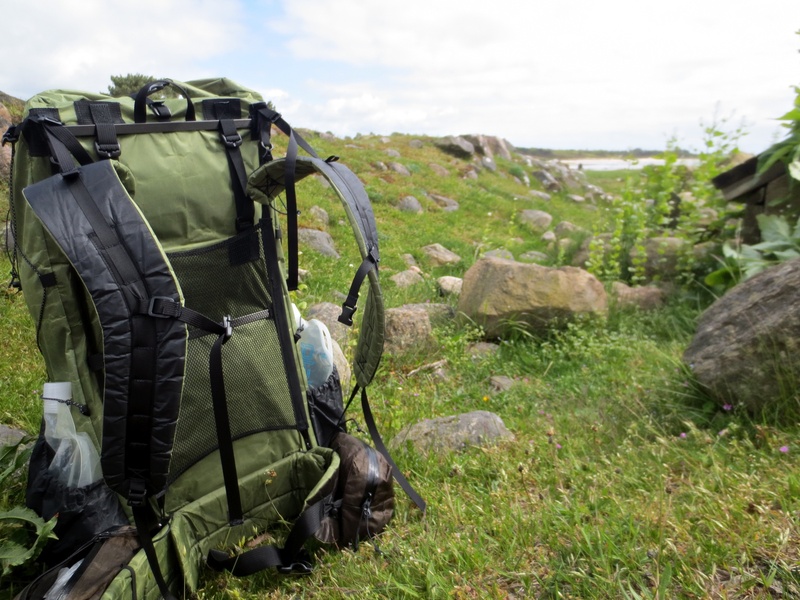 Also note the dyneema shoulder straps and roll top that clips down to the side of my pack. Kept the temperature really well. I love the waterproof dry/stuff bag that comes with it. Considering getting either lighter version, possibly a WM Hi Lite to save some weight. One of the few items I’m not satisfied with. To sleep better during longer trips I have now realized i need a wider and full length sleeping pad. Considering getting a Klymit pad for this. Superb! Nothing more to add. Besides the weight the only problem with this inner tent was that its lack of solid walls made it quite chilly inside the tent when the winds got stronger. For future trips in these kind of conditions a similar version with solid fabric for the lower part of the walls seems like a good idea. Light weight and dry up fast, an important ability when doing lots of river fording. On the downside these pants are starting to get worn out. Seems are loosing and I got a couple of small holes in them. I think I will look for a new set of pants for next season. Hopefully I can find a model with zippers on at least one of the front pockets. Sheds away sweat like a champ. Dries up fast. It’s a keeper. State of my shoes after one day in the lavasand! These shoes fits me perfectly. The toe box is a bit larger than usually and gives good room for my toes. Inner soles were completely finished after this trip, so when i found them at a discount in a nice green color at Wiggle i ordered directly. I don’t know why I didn’t switch this piece of crap out after last year. Loosens up all the time and forces me to stop and adjust both pants and belt. Combined with Andrés bad experience with Haglöfs products I am now starting seriously to question the quality of their products. Needs a replacement asap. One of the few moments I didn’t wear the wind shirt, only my Icebreaker Merino. Sunglasses neatly stuffed in my shoulder pocket. Used more or less all the time. Combined with an outer shell this gives enough warmth for all but the coldest weather. Used by itself it ventilate good enough to be worn almost all of the time. I actually think this shirt was worn 99% of the time I was on trail. Dries up to slow. I need to get a pair of merino boxers. Wearing regular pants there is no need to have longer socks than this. Combined with a pair of 10 denier ankle socks I managed to keep my feet in perfect condition. Despite walking for over 20 km in snow, crossing dozens of rivers and in general walking with wet feet. Extra socks I wear to warm my feet when sleeping. Keeps me warm and gets my feet dry. These started to get wet after a couple of days. I only use these at camp to let my wet feet rest and get warm. So these socks don’t get used much. Have heard good things about Rocky GoreTex socks so I’ll maybe give them a try. Didn’t use this much at all. But it fills a niche when I need an extra layer and is to sweaty or wet from rain to use my down jacket. Stays for future trips. Only needed this for cold nights in the tent. Did the job well. Only alternative I could see is a pair of down pants but im a bit sceptical about those. Incredibly we had only lighter rain showers so I only used this jacket once! It’s lightweight and keeps away rain showers reasonably. But I have noticed that the Pertex fabric is starting to peel of at the shoulders. I guess the wear from the shoulder pads is to much for this fabric. Think I will keep my eyes open for a eVent jacket. Didn’t need to use these. Light weight though. Montbell Ex Light Wind Parka. 65 gr of wind proof magic, straight from Japan. MVP of this trip. Used this ridiculously light wind jacket so much. It breaks wind perfectly and is quick to adjust when you get warm. 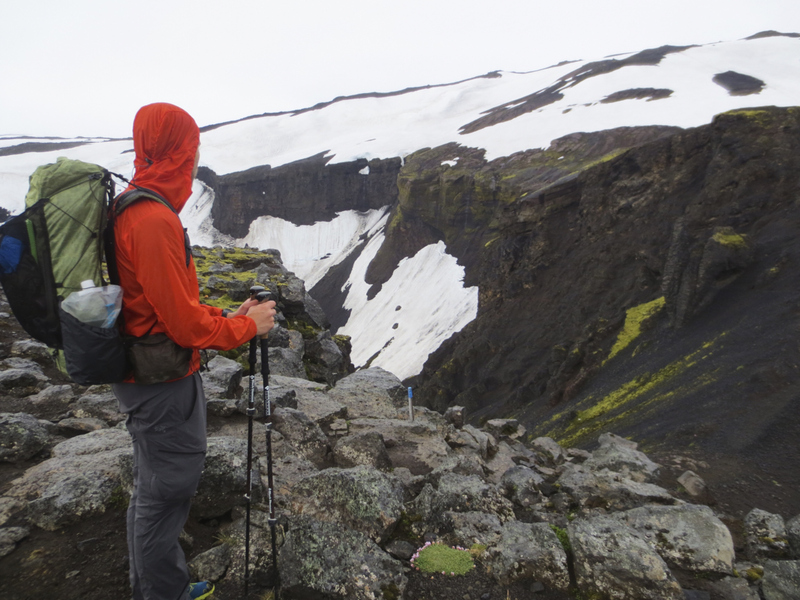 Even the super flimsy hood does a good job of keeping my head warm in the chilly winds of Iceland. Super light down jacket. I downgraded from my thicker Arc’teryx hoodie that was overkill for these conditions. Used as insulation for shorter stops and at camp. These gloves still hold up and suits me perfectly. Didn’t need to use the waterproof shell but it’s a nice insurance to have if the weather gets really bad. Cheap and durable Wayfarer style shades. For hikes in more sunny environments I would probably go for something with more cover. A quick stop on the way up Mount Gathilur. 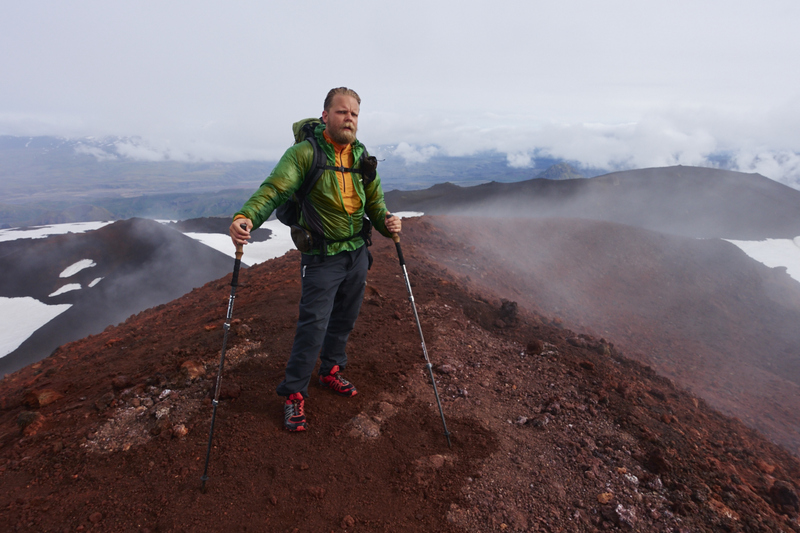 On ascents like these hiking poles are a great help. 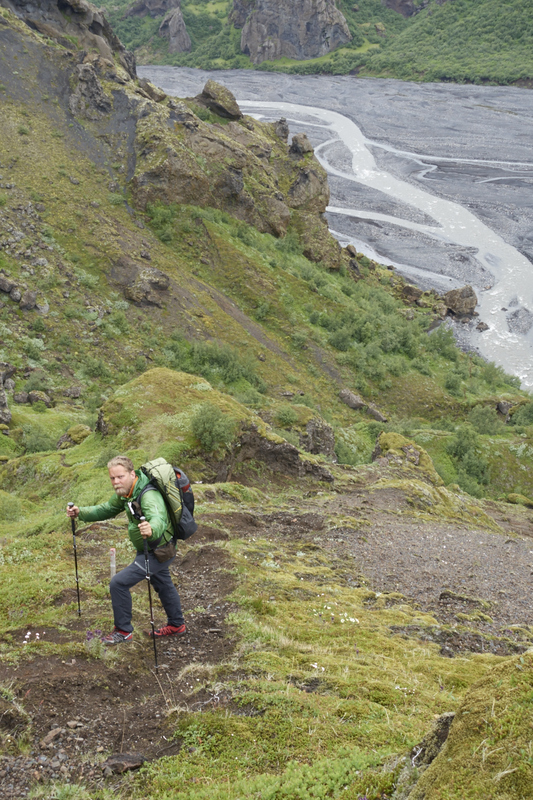 These trekking poles are perfect. The flick lock system doesn’t compress a single millimeter. I used them almost all the time and at night they double as support for the shelter. The fact that these poles are not at a fixed length also makes it possible to pitch the shelter at different heights depending on how much airflow you want. I have yet not needed to use the snow baskets for these so I think they will have to stay in the gear box for now. Didn’t use this one very much as André stood for most of the filming. I’ll leave this one at home next time. This one was ready in my shoulder pouch and I took loads of pictures. Of course not a high end tool but ok for my needs. A long spoon for your freeze bag meals. Some times it’s just that easy! Perfect to dig up that last bit of mashed potatoes out of the bottom of your freeze bag. Ditched the push pull cap for a normal screw on version. Does it’s job, lightweight and still holds up. A dry bag for my dry clothes and a lighter stuff sack for my food. I have learned that one dry bag is enough for me. Use a 3 L Zip lock as extra storage for wet clothes that i don’t want to put in the dry bag. Used this only with alcohol this time as wood is quite sparse on Iceland. Worked well but takes its time to get water boiling. Used this for cutting cord, opening food bags and so on. 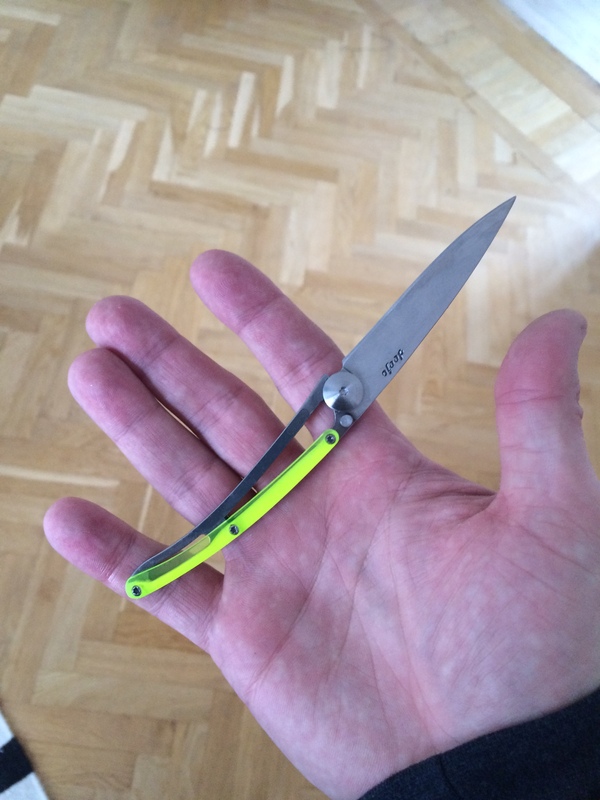 Does what it’s intended for but don’t expect more from such a small blade. So, for the future I can see some room for improvement. Of course some of these are depending on where we I will be going next. But there still are some smaller items I wan’t to switch. 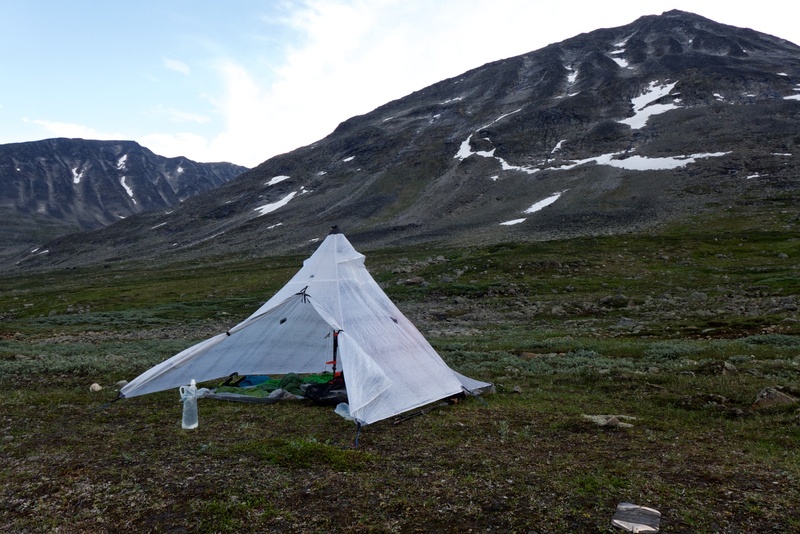 But in general I feel that I now have nailed down a very good UL-kit that I can depend on in tough conditions! It’s white, it’s crinkly, it’s waterproof and it feels like it weighs about as much as a tissue paper. 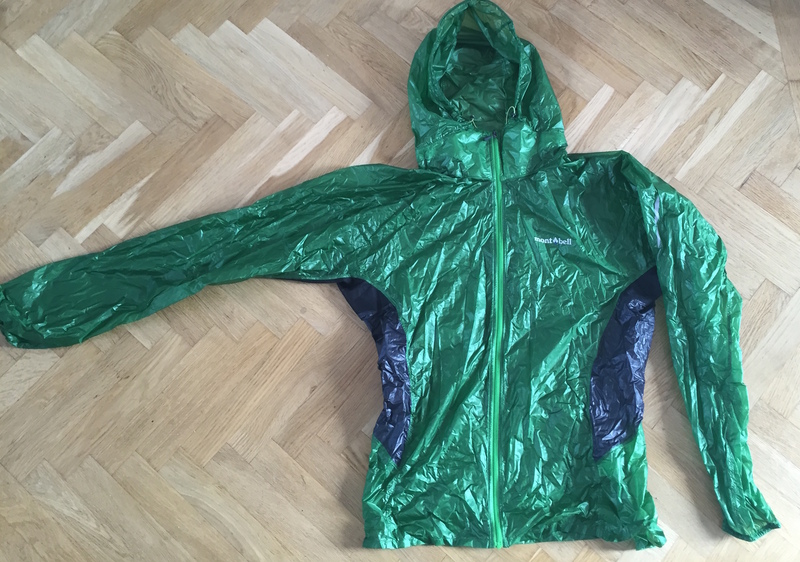 But what exactly is Cuben Fiber, and why use it? 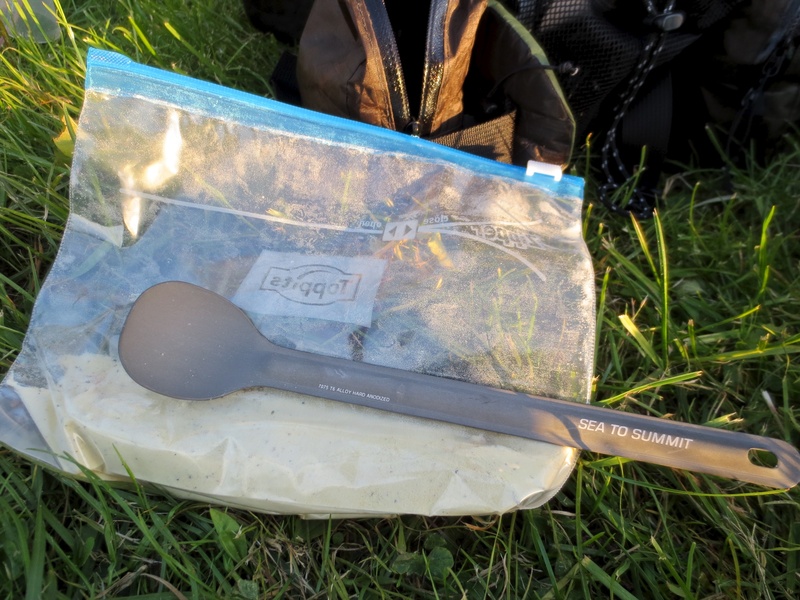 When I first delved into the world of ultralight backpacking, I combed the Internet trying to find a technologically advanced material that would change my backcountry experience. The fabrics used at the time had major limitations. For example, Silnylon, the primary lightweight fabric used, absorbed moisture and swelled and sagged, requiring constant re-tensioning. The slippery material also forced people to put liquid glues on the floors of their tents to keep their pads in place. Worst of all, silnylon is made when both sides of a thin, woven nylon fabric are saturated with liquid silicone, and there were no standards for these silicone coatings. So basically every batch was different. So when I discovered a small cottage industry outdoor company using Cuben Fiber I did some more research. Read more at Hyperlite Mountain Gears blog. 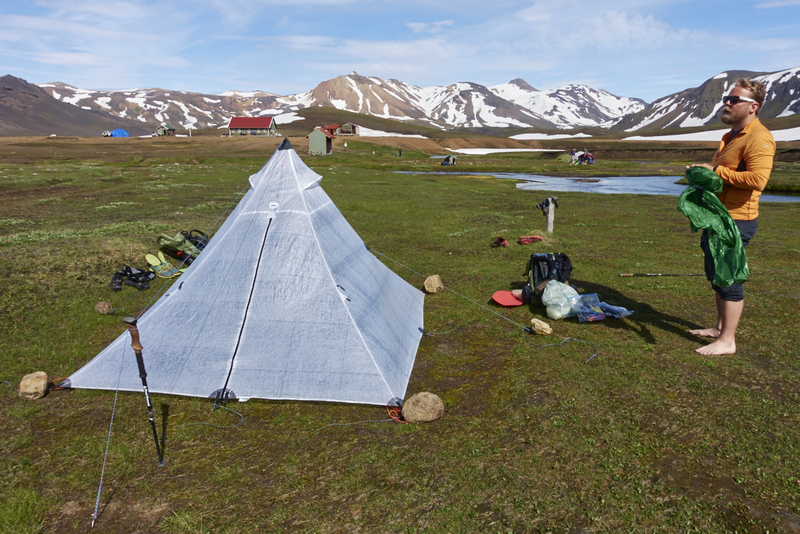 Cuben Fiber is the best fabric for ultralight shelters and backpacks, no doubt. The Japanese post service sure knows how to haul stuff! Received my Imo Pack today, Friday after a five day transport from Japan to Sweden. 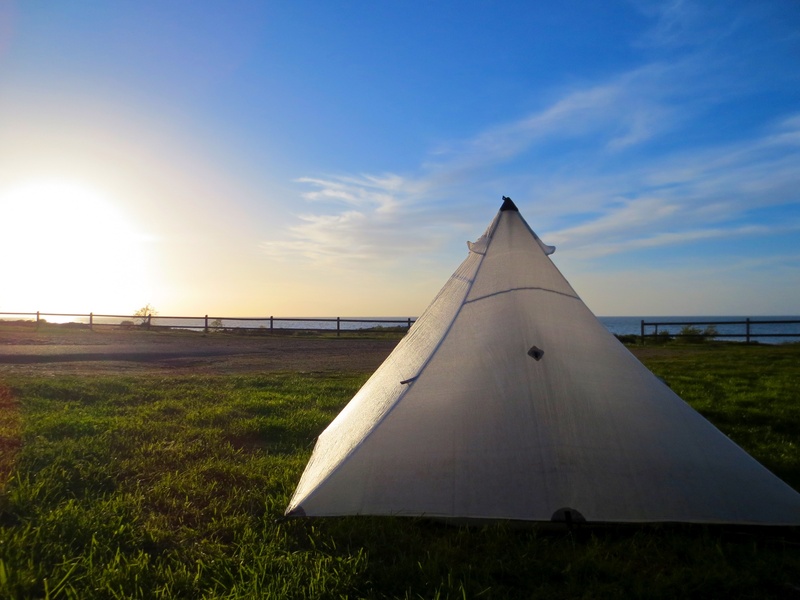 I’ll try to sum up my first impressions of the KS Ultralight gear Imo Pack here. Later on I will have to follow up with some reflections after taking the pack to the trail. One of the things about UL-hiking I really like is all the Cottage Manufacturers making excellent equipment for us hikers. I like the oportunity to support a small scale industry with design and manufacturing in house. But a large bonus is also the possibility to customize the equipment you want to purchase. As a Design Engineer this is kind of a kids dream coming true, I can get equipment exactly the way i want it! Last week I found the small (Even by these standards) Japanese/French manufacturer KS Ultralight Gear. 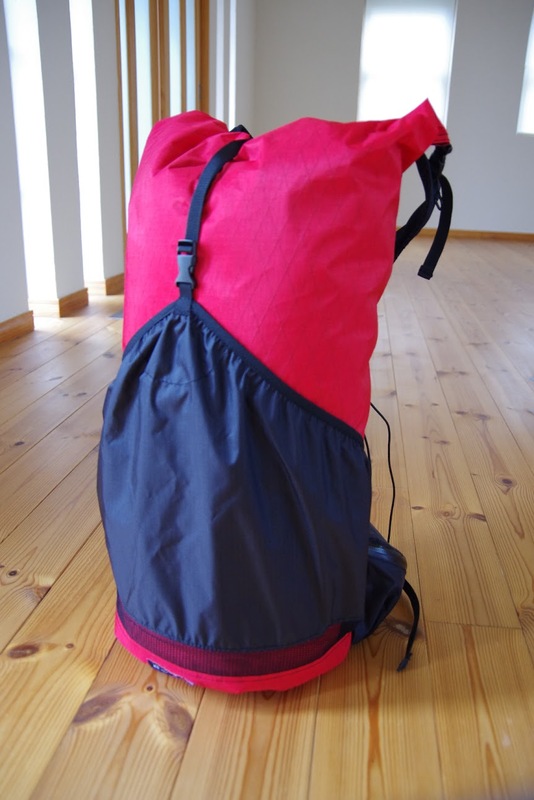 They make various versions of ultralight backpacks in interesting material choises as X-pac, Silnylon and in some cases Cuben. Foldsack No. 1 in autumn leaf. I’ll use this backpack as a everyday carry bag and for small adventures, no overnighters, well maybe in the summer if it’s warm. One thing that’s great with it is that it has got an integrated laptop sleeve that I’ve been needing for some time. It’ll take a 15″ laptop. The bag is at 16L so it’s not too big. I think it would be great as a backpack for school or going to the office. 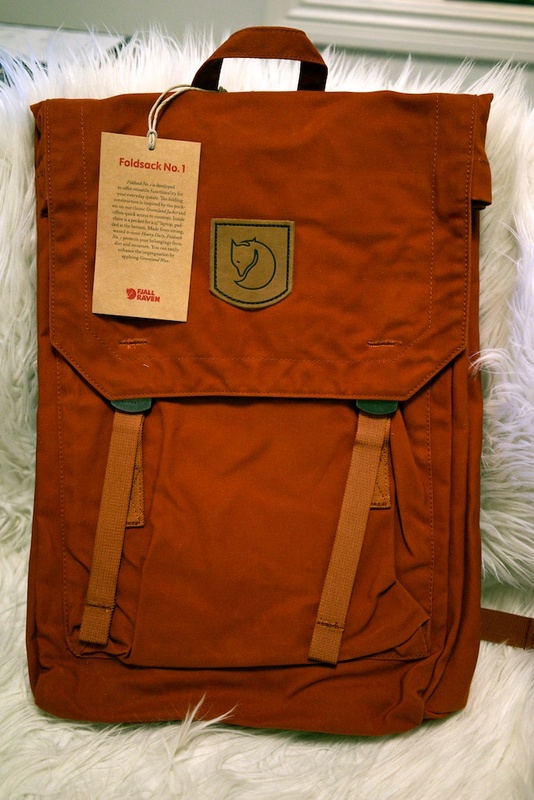 You can read more about it here at Fjällrävens product page.